Graham Farmelo, The Daily Telegraph, January 13, 1999. A brilliant and bohemian British scientist, Stephen Wolfram, is poised to publish a book that he believes will be as influential as Darwin's Origin of Species. Graham Farmelo describes a simple approach to a complex subject. In a few months' time, a brilliant British scientist will publish a book that promises to revolutionise science. If the book's ideas are as successful as its 39 year old author Stephen Wolfram believes, 1999 will see the greatest event in scientific publishing since Darwin's Origin of Species 140 years ago. Wolfram is confident that his book, A New Kind of Science, will make all scientists think afresh about how they approach their work. What is more, he has followed Darwin by writing up his ideas in a book that anyone can understand. I first met Wolfram 20 years ago, when he was an amiable but intimidating wunderkind at the California Institute of Technology, one of the powerhouses of American science. He hasn't changed much, as I found recently when we had a lively dinner together near his company's headquarters in Champaign, Illinois. He has the same bright eyes, the same bohemian dress sense, the same self-belief, the same blazing ambition. "For 300 years exact science has been dominated by one particular set of ideas about mathematics and things. I'm planning to change that." So why should we take Wolfram seriously? Why is he any different from the legions of deluded scientific rebels who spend their waking hours shooting off typewritten missives to all and sundry, explaining why Einstein got it all wrong? Well, for one thing, Wolfram has an outstanding pedigree both as a mainstream scientist and as a world-leading computer software pioneer. A year before I met him at Caltech, he had fled Oxford University without completing his first degree ("not challenging enough"), having previously left Eton without bothering with his A-levels ("too trivial") but having published his first scientific paper when he was only 15. He never studied for his doctorate, but Caltech awarded him a PhD after he'd simply put together a thesis by binding together six of his papers. At the beginning of his career, in the late Seventies and early Eighties, Wolfram did important work on the theory of sub-atomic particles and on the beginnings of the universe. He also started investigating a subject that would become one of the foundations of his new theory. What he did is almost childlike in its simplicity and, as he points out with a smile, could perfectly well have been done hundreds or even thousands of years earlier. To understand what he did, imagine an outsize chess board in which each square is either black or white, and imagine that the sequence of squares on one horizontal row determines the sequence of the one below it, according to a simple set of rules. These rules automatically determine how one row of cells determines the next, leading to the ungainly name "cellular automata". In 1988, while his academic career was in full flight, Wolfram astonished his colleagues by leaving the academic world to set up his own computer software company. "To make progress with what I wanted to do in science I needed better tools, and the best way I knew to get them was to build them myself." 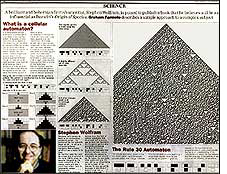 The result was the computer program Mathematica, which, as Wolfram intended, was useful not only to him but also to everyone who needed to do complicated mathematics. "By far the best way to turn raw ideas into practical realities is through entrepreneurial companies," he argues, with all the zeal of a venture capitalist. His company soon released his Mathematica software, which has since enabled scientists to zip through hideously complex mathematical operations in a few minutes, instead of sweating over them for weeks on end. Over a million people currently use Mathematica, the flagship of Wolfram Research, now the world's leading technical software company. "I try to choose the things I do to be unique and to have value that really lasts; that's what I did with Mathematica and I'm very happy with the results," Wolfram told me, sipping his glass of 7-Up. "The science that I've been building for the past 20 years is like Mathematica in that way—but much bigger." Wolfram had first seen the need for a new kind of science in the early Eighties, when he'd become intrigued by the sheer complexity of the natural world and how it could have arisen from its supposedly simple foundations. How did the universe, which spent its first few minutes as a uniform consommé of fundamental particles, evolve into the lumpy casserole it is today? Why doesn't conventional science enable us to understand easily the shape of a rose petal or the shape of forked lightning? And how did each of us come to have the most complex object we have ever observed in the entire universe‹the human brain—between our ears? Wolfram convinced himself that the answers to basic questions like these will never come from the well-established theories of science. The clue to the new approach came from his work on computer programs. "In Mathematica, everything—numbers, text, graphics and equations—is built from just a few simple building blocks. What Mathematica does is to apply simple rules to the building blocks. "One might have thought—and I certainly did—that with simple rules one could only ever make simple patterns," says Wolfram. But in 1984 he made a discovery that was what the falling apple was to Newton and his theory of gravity, and what the Galapagos finches were to Darwin and his theory of evolution. Some cellular automata, like the first one shown do indeed produce simple patterns. But others do not. "The rule 30 automaton is the most surprising thing I've ever seen in science," says Wolfram. "Even though it starts off from just one black cell, applying the same simple rule over and over again makes rule 30 produce the amazingly complex pattern. "It took me several years to absorb just how important this was," says Wolfram. "But in the end I realized that this one picture contains the clue to what's perhaps the most long-standing mystery in all of science: where in the end the complexity of the natural world comes from." As I struggled to take in the sheer scale of his claims, I practically choked on my lasagne. Wolfram is keeping the details close to his chest for the moment, but all will be revealed in his book. He promises to describe in detail how he believes nature generates the complexity we see around us—from the shape of a snowflake, the forms of living organisms, and so on—by repeatedly using simple rules. "I've been amazed at how many problems from all sorts of different branches of science I've been able to crack. I think I finally understand the answers to basic questions in biology, physics, mathematics and computer science. For example, why really biological organisms seem so complicated. And also why time seems to progress in one direction. I even think I've finally got some serious beginnings for a truly fundamental theory of all of physics." Wolfram has said that he wanted to write a short book, but he says he's discovered too much for that. The draft now runs to 1,000 pages, features more than 1,000 Mathematica-generated images and graphics but scarcely a single equation. "The details will be there for the experts, but I wanted the book to be understandable by everyone with an intelligent interest in science. If the ideas are fundamental enough, the experts don't have any advantage over anyone else in understanding them". As he tucks into his dessert, it is plain that he's relishing the prospect of instigating what will apparently be something of a scientific revolution. By not publishing his results in peer reviewed journals before writing them up into a book, Wolfram is risking the wrath of the academic world. When I put this to him, he bristles. "It certainly would have been easier for me to publish what I've done in 500 papers. But I don't think anyone would have got the point. "I think the only way to explain the big ideas I have is to release everything in one go, so everyone can see the whole picture, with all the supporting details. A bit like Darwin did in his Origin of Species." As well as continuing to be Obergruppen-führer of his expanding company, the certifiable workaholic Wolfram is working harder than he's ever done to complete his magnus opus. But he is now looking forward to concluding his book and to becoming "rather less of a recluse". So will his book be the last damp squib of 20th century publishing or will it set the agenda for the science of the new Millennium? He seems sublimely untroubled by doubt. "Right now when people talk about science they think of physics, biology, chemistry and so on. In 20 years, for better or worse, they'll also be thinking of my new kind of science." And with courtesies swiftly dispensed, he shuffles off into the night. Graham Farmelo is head of exhibitions at the Science Museum, London. © Graham Farmelo, 1999 This article was first published in The Daily Telegraph.